T-R PHOTO BY THORN COMPTON - Marshalltown junior Madi Finch makes a running forehanded strike at the ball during a doubles match in the Bobcats’ meet win over Des Moines Lincoln on Tuesday. Finch swept her singles match, while she and Olivia Brintnall were winners at No. 2 doubles. 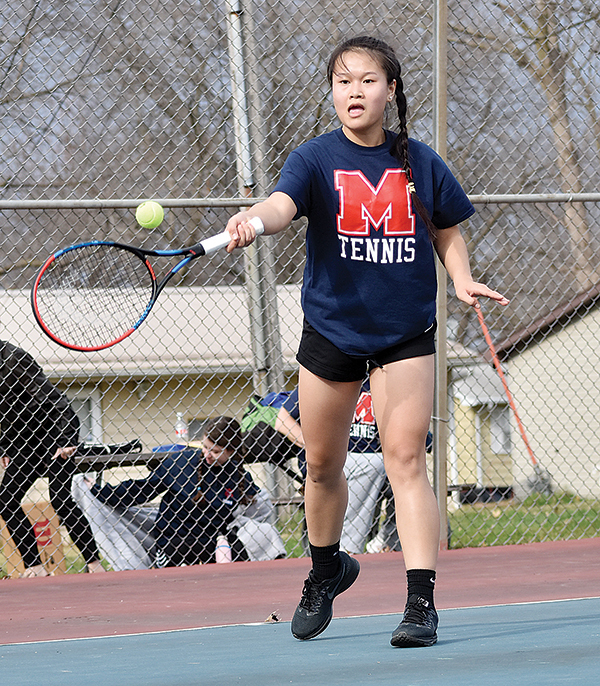 After back-to-back wins in their last two meets, the Marshalltown girls tennis team reached a new height on Tuesday with its first sweep of the season. 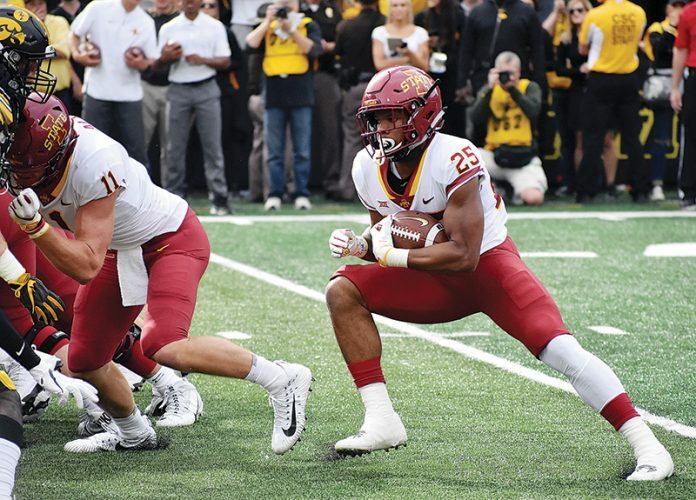 The Bobcats won at home against Des Moines Lincoln, 11-0, to improve to 3-1 on the season, their best start to a year since starting 3-1 in both 2009 and 2010. 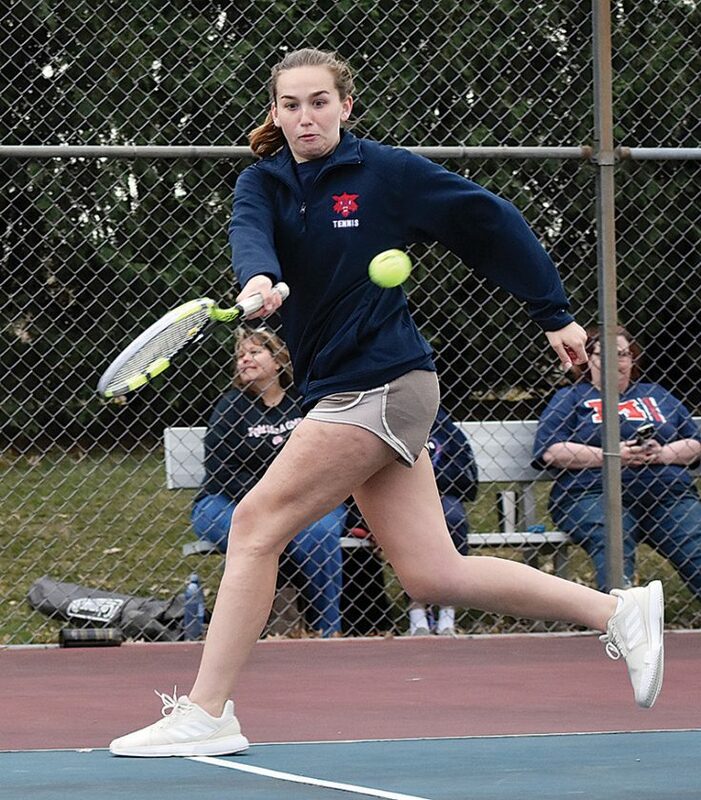 MHS head girls tennis coach John Fiscus said it was a great showing for his girls that continue who continue to show some stellar tennis skills early in the season. Not only did the Bobcats not lose match, they didn’t lose a set to the Railsplitters. 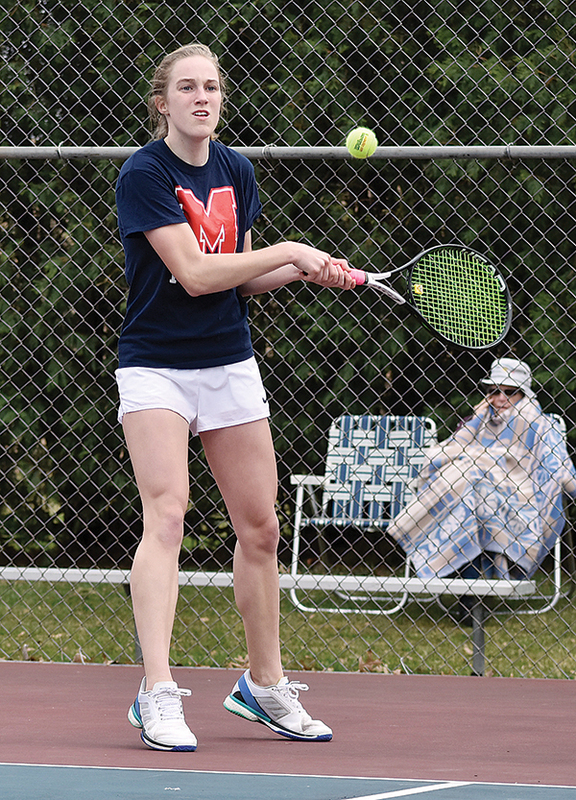 Marshalltown already won the meet after going 6-0 through the singles matches, and every match was generally won going away. Emily Miller won 6-1, 6-1, at No. 1 singles, Mary Kate Gruening was a 6-3, 6-2 winner at No. 2, Madi Finch rolled through with the lone singles sweep with a 6-0, 6-0, win at No. 3, Olivia Brintnall was a 6-1, 6-1, winner at No. 4, Grace Fisher moved up to the No. 5 spot and won 6-4, 6-0, and Hel Ter rounded things out with a 6-2, 6-2, victory at No. 6. T-R PHOTO BY THORN COMPTON - Marshalltown senior Hel Ter hits makes a forehanded hit on the ball during the singles matches in the Bobcats’ 11-0 sweep of Des Moines Lincoln on Tuesday in Marshalltown. Fiscus said the win on Tuesday was dominant, but he was most encouraged by it coming against a team that was unlike the other two his girls had beaten this year. Finch is one of five girls who has won three-straight singles matches on the team. Finch didn’t play any singles on varsity a year ago, and she said the difference between this year and last so far has been her ability to volley. The doubles matches were just as lopsided as the singles ones. Miller and Gruening were 6-1, 6-0, winners at the No. 1 doubles spot, Finch and Brintnall went 6-1, 6-1, at No. 2, Fisher and Jillian Lang won 6-1, 6-0, at No. 3, Ter and America Dominquez took a 6-1, 6-4 win at No. 4 and Carly Streets and Stella Roseburrough Borras were 6-0, 6-1, winners at No. 6. Finch and Brintnall showed some great chemistry in their doubles win as well, and Finch said that’s because they compliment what each other does well. 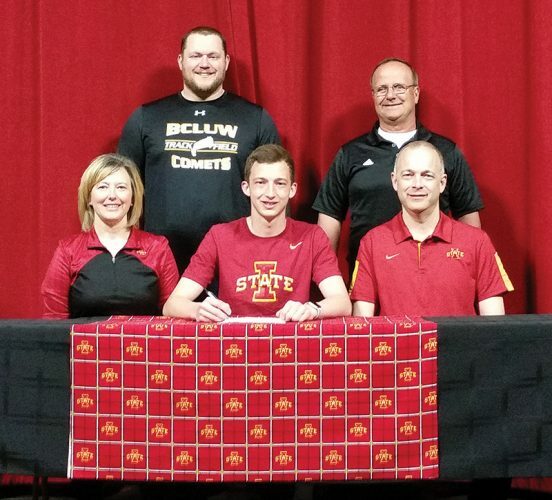 Fiscus said Brintnall and Finch both are good singles players in their own right, but together on the court right now they have upped their game to a new level. Also showing great teamwork have been Fisher and Lang, and Fiscus said Lang specifically might be doing enough to break into the singles lineup. Coming into the season, Fiscus was sure about his top four players but the rest of the lineup was a question. Now that the Bobcats have won three straight and are off to their best start in almost a decade, he said the biggest surprise has been the production from the bottom of his lineup. That lineup will continue to be tested as the season moves along, however. Up next Marshalltown hosts Fort Dodge on Thursday and Waverly-Shell Rock on Friday, with both meets starting at 4 p.m., weather permitting.